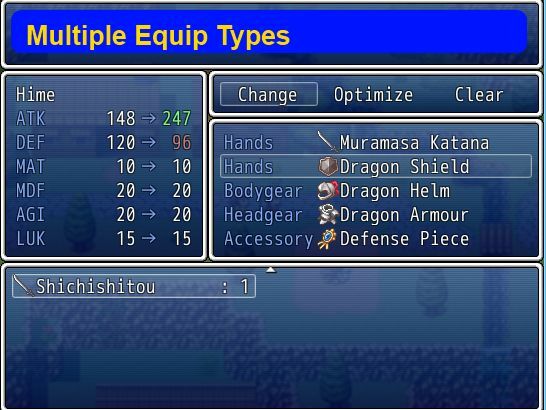 This script allows you to assign multiple equip types to an equip. By default, each equip has only one equip type. For example, a sword is a “Weapon” equip type and can only be placed in “Weapon” slots. A wooden shield is a “Shield” equip type and can only be placed in “Shield” slots. With multiple equip types, you can place an equip in any slot that it is compatible with. For example, you could create a slot called “left hand” and another slot called “right hand” and then specify that certain equips can only be held in your left hand, certain equips in your right hand, and certain equips in any hand. table that you set up. Hi, do you think it would be possible to have the exact same functionalities, but for weapon types instead of equip types ? I received a NoMethodError on line 133. It’s when I use the Luna Engine. What if you take out Luna Engine? Put together a new project with only luna engine and the script, demonstrating the issue. Then send me the project so I can look at it. Now it works! You can use it now! I’ve updated the script to do some additional checks in case things aren’t as expected. See if this works now. Hime, can i assign an armor/weapon with 3 or more types? The armor shows to equip with the slots, but only equips the first. When i try to equip in another slot the armor just disappears. I use your custom slot/core equip scritps too. No, that is not normal. I have tried it right now where I tag a weapon with all 5 equip types, gave myself 5 copies of the weapon, and then equipped it top all 5 slots. Verify that this occurs in a new project. I’m not sure what the problem is. Could you help me out? When I create a new project with only the required equip scripts, I don’t have that issue. Maybe it is a compatibility issue with another script? Hi Hime, I was wonder if there was a way to check by slot id if anything is equipped at all. Where SLOT_ID is the ID of the slot. Remember that you need to subtract it by 1 to get the correct slot. Thanks, the game_actors[index].equips[slot] is exactly what I needed. I’m trying to fix a problem in an equipment scene that uses etype id instead of slot id. I’m not sure where you asked that but my email said someone asked that question. Great script as usual! Very good for any project that utilizes flexible or permanent class changes. If you&apos;re referring to my utility script for "equip checks" then it would be atype_equipped? or armor_equipped? depending on what you want to check.